Write a simple PHP class which displays the following string. MyClass class has initialized ! 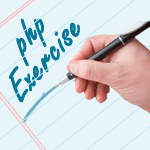 Previous: PHP Classes Exercises Home. Next: Write a simple PHP class which displays an introductory message like "Hello All, I am Scott", where "Scott" is an argument value of the method within the class.